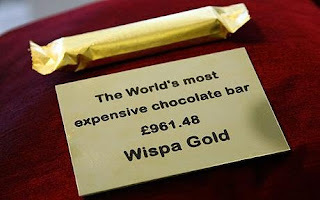 Wispa Gold - The wonderful people at the Wispa factory brought back the Wispa Gold. The greatest chocolate bar of my childhood. I bought one this morning on my way to work and I can feel it calling from my desk drawer - EAT ME, EAT ME, EAT ME. Bed - Or lack of. I don't love my lack of bed right now but I can't wait until the weekend and I get to sleep in every morning up at MR T's house. The fact that I haven't managed to eat dinner once this week. I still haven't been able to find a Wispa Gold! None of our local shops have them, it's terrible. Replace your archery related gripes with my mountain biking gripes, and you've got my news for the day! No one could ever think that you're a crap friend. The lasagne made for a great lunch, thank you.